Press Split to start timing Split. Press Split again to stop timing a Split and to start timing the next Split. At the end of the last Split, Long press Split to stop timing. 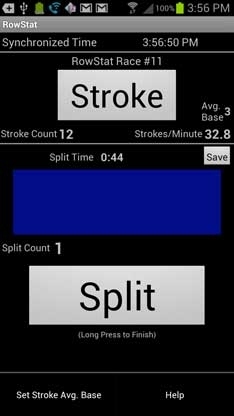 During a Split, press Stroke for each stroke to record and display the running average Stroke rate. The Stroke Rate displays when the average base number of strokes is entered. To change the Average Base, the number of strokes used to compute the running average, press Menu on the phone and choose Set Stroke Avg. Base.